1. Wash and dry the bottles. In one of the bottles cut the bottom. 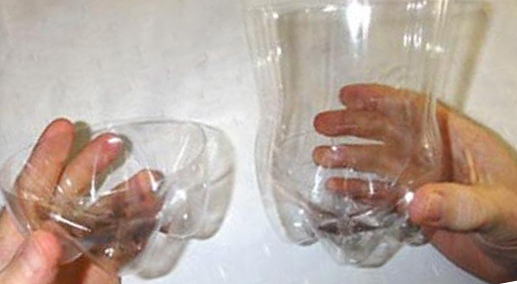 Cut the second bottle in half. 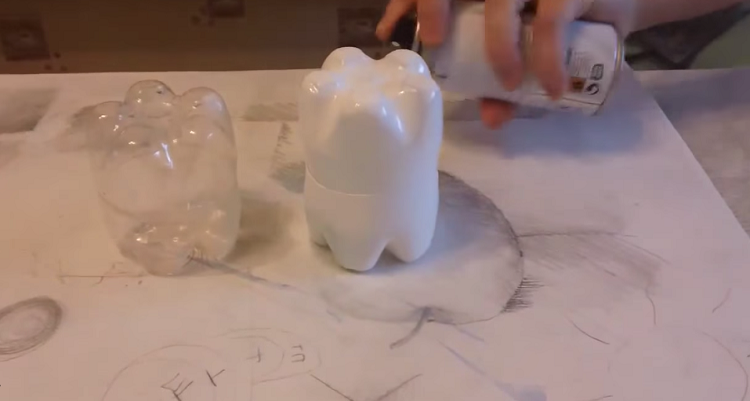 For further work we will need the bottom half of one bottle and the bottom of another. 2. Bond 2 parts by inserting one part of the bottle into another at a depth of about 2 cm. Mark the edge that we need to grease with glue. Dismantle the parts, grease the edge of the larger bottle with glue (up to the mark) and top again “put on” the bottom of the second bottle. 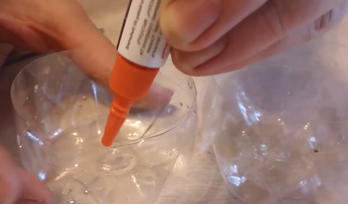 Try to apply a small amount of glue, enough to be a few droplets, and keep an eye on its temperature, so that the plastic does not begin to melt. 3. Then evenly apply a primer on the part. It is needed to better lay paint. Wait until the primer dries. 4. Take a sheet of cardboard, draw on it the abdomen of the future penguin and cut on the contour. 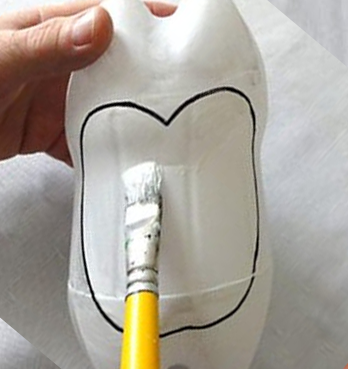 Attach the finished template to the bottle and circle it with a black cd marker. Color all the abdomen in white. Try to paint carefully so that the black contour remains unlubricated. Apply several layers of paint. 5. The legs and the body of the penguin color in black. Wait for the paint to dry completely. If necessary, correct the contour of the abdomen with a brush. Now we’ll draw the penguin cap. Choose your favorite paint and paint her hat, then decorate it as you please. 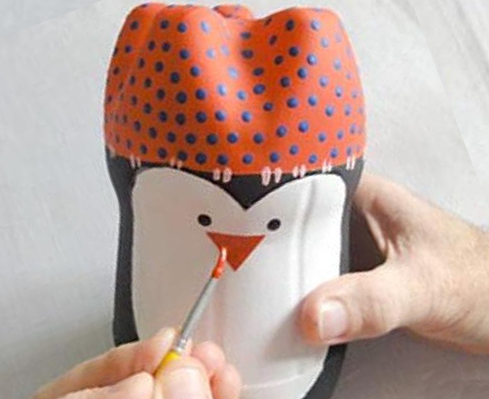 Then draw the eyes for our penguin and beak. 6. Wait until the paint is completely dry and apply a layer of clear varnish to secure the result. 7. If desired, can make pompom for the hat. For this purpose folded together 2 fingers wind several layers of a thread. The more you make the turns, the fluffy will look a pompom. 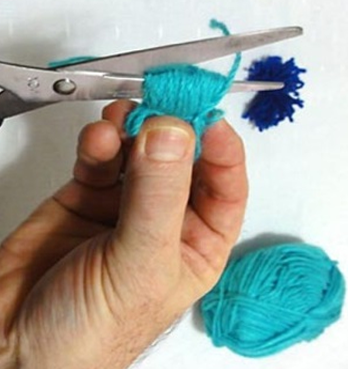 Remove the hanky of threads from the fingers and tie it in the middle. After that, carefully cut the loops and if there are protruding threads, then align them. 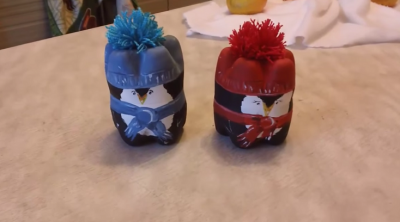 Pompom paste on top of the penguin hat. To make a scarf, use the narrow segment of the fabric. Wind it around our penguin’s neck and tie it up.